In our in-depth review of Flexitol Medicated Foot Cream, we will point out this product’s strong points and weaknesses regarding treatment of fungal infections. This is a unique anti-fungal foot cream in that not eliminates fungi, but also acts as a moisturizer to return skin to its vibrant state. If you are interested in this particular product, continue reading our review to learn more. Each ingredient focuses on the various symptoms of foot fungi. Tolfanate helps eradicate fungi and keeps it from growing back. Urea is an agent that breaks down damaged skin that allows the tolfanate to properly penetrate the infected area thoroughly. Finally, menthol is a known external analgesic that helps alleviate soreness and soothes the skin. The application of Flexitol Medicated Foot Cream is quite standard. First and foremost, you must make sure that the area you will apply this ointment to is properly cleaned. Wash it with lukewarm water and soap and ensure that it is completely dry before applying the cream. Do this 2 times per day, preferably during the morning and again at night. If these instructions are followed accurately, you will notice improvements within 4 weeks of use. 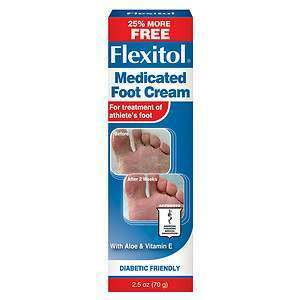 The known side effects of Flexitol Medicated Foot Cream include a stinging sensation on the affected and itchy skin. These side effects are mild and are common to certain people with sensitive skin. To avoid incurring these side effects, it is best to consult with your doctor before trying out new treatments. Each bottle of Flexitol Medicated Foot Cream contains 56 grams of specially developed anti-fungal ointment and will cost $7.86 each. This is available on well-known online shopping sites as well as several drugstores. The official website does not indicate any sort of money back guarantee or refunds. This might not actually be much of an issue as this is one of the cheapest anti-fungal creams available today. However, that may also mean that the product is not as effective as other, more expensive anti-fungal creams available today. The lack of a guarantee can be quite worrisome even with several customer testimonials that claim this product helped them treat their fungal infection problems. The Flexitol Medicated Foot Cream is one of the more affordable options for treating fungal infections on the feet. This is a specially developed anti-fungal cream that not only acts to eliminate infection, but also moisturizes and revitalizes the skin. The biggest drawback here is the lack of a solid guarantee, and lack of proof that it is effective. There are several customer testimonials that claim that this product caused a painful burning sensation upon contact with the skin. Jimmy Rodriguez	reviewed Flexitol Medicated Foot Cream	on November 19th	 and gave it a rating of 2.5.